On September 4, the sun erupted with an Earth-directed coronal mass ejection (CME). According to National Oceanic and Atmospheric Administration (NOAA), the event occurred at approximately 20:33 UTC and originated from an active sunspot region (AR2673) near the center of the solar disk. CMEs are huge explosions of magnetic field and plasma from the sun's corona. When CMEs impact the Earth’s magnetosphere, they are responsible for geomagnetic storms and enhanced aurora. The fastest CMEs erupt from large sunspot active regions, powered by the strongest magnetic field concentrations on the sun. These fast CMEs can reach Earth in as little as 14 to 17 hours. NOAA forecasters are still analyzing the available data to determine if and when exactly the recent CME will reach Earth, and what impact it could have on our planet. They initially estimated that this CME could reach the Earth on September 6. 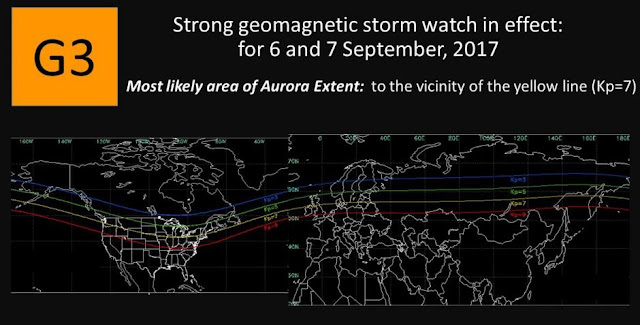 Moderately strong (G2-Class) geomagnetic storms are expected when the CME will arrive at Earth on Wednesday and isolated periods of strong G3-Class storming could occur on September 6-7. Moreover, radio blackouts reaching the R1-R2 (Minor-Moderate) levels are expected for September 5-7, with a chance for R3 (Strong) radio blackouts as the sunspot region AR2673 continues to show enhanced magnetic complexity and increased radio blackout activity.